This is a lovely example of Thomas Webb's cut glass production. The pattern and shape of the decanter is similar to the later 'Sheraton' Design. The stopper may not be the original. The stopper is of the scalloped disc type. A lovely collection of 8 signed THOMAS WEBB crystal wine glasses in the attractive KINGSWINFORD pattern. Fully marked 'THOMAS WEBB ENGLAND' on the bases. so a reasonably sized wine glass. Lovely set of good quality glasses. They are unmarked so I'm unsure of the maker but they feel like good quality so most likely Whitefriars or Webb. Webb Corbett - Pair of etched waterTumblers - Art Nouveau Design - Signed. Webb Corbett - A pair of tumblers with a design from the "Art Nouveau" period. Elegant & unusual pattern from a quality manufacturer. Both Tumblers are signed indicating a date from 1930. LEAD CRYSTAL ROSE BOWL FROM WEBB CORBETT. THIS BOWL IS IN VERY GOOD CONDITION HAVING NO CHIPS, IN A BEAUTIFUL DESIGN. HEIGHT IS APPROXIMATELY 4.5" ANY QUESTIONS PLEASE DON'T HESITATE TO CONTACT ME. PLEASE SEE MY OTHER ITEMS. A pair of port / liqueur glasses in the Juliette pattern etched Royal Doulton on the bases. They are in good condition and will be well wrapped. This beautiful crystal preserve jar, made by Thomas Webb & Sons in the 1950s, is a high quality and highly usable item for a modern interior. The base of the jar is acid-etched ‘WEBB ENGLAND’. Made from heavy crystal glass and sharply cut with a quilted diamond pattern around the body of the jar, the delicate lid is cut with a star pattern and large knop. Made by Webb Corbett only the wine glasses are signed. Diamonds with crosses in and palm leaves at top with star base and knop. HIGH TUMBLERS, ALL WITH 1966 WEBB CORBETT MARK AT THE BASE. THESE ARE HIGH QUALITY HAND BLOWN AND HAND CUT TUMBLERS. THE TUMBLERS ARE 9.5 CM HIGH. Boxed Set Of 4 Claret Wine Glasses. Warwick P attern. Thomas Webb Cut Crystal. RARE ROYAL DOULTON CRYSTAL GEORGIAN SMALL SPIRIT WHISKEY DECANTER SIGNED 7"
≈✿❀❁≈RARE ROYAL DOULTON CRYSTAL GEORGIAN SMALL HALF SIZE SPIRIT WHISKEY DECANTER SIGNED 7"≈❁❀✿≈. 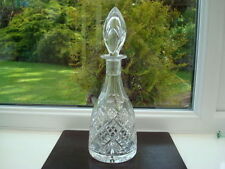 ❈ A BEAUTIFUL SMALL SIZED ROYAL DOULTON DECANTER. ❈ PATTERN IS GEORGIAN - CLEAR CRYSTAL WITH CUT PATTERN OF CRISS CROSSES, FANS & OVALS. 6 near perfect tumblers in makers' original box (not a presentation box) No chips or scratches. Tall pair of Thomas Webb International 'Cleopatra' champagne flutes. They are 25 cms tall and in superb unused condition with original labels. They are all in very good condition and although pre-owned they do appear unused. This sale is for 6 glasses together. In excellent condition, no ware marking on bases, have never been in a dishwasher. Royal Doulton, Crown Logo, and England etched on bases. 5 available. 2 beautiful and rare Thomas Webb signed port or sherry glasses. These glasses are hand blown and look to date from the early 20s. The date range for the signature is from 1906 to 1935. THOMAS WEBB CRYSTAL 9" FRUIT/SALAD BOWL BOXED, USED. Thomas Webb 9" fruit/salad bowl. St Andrews pattern 32040. An attractive Thomas Webb amber glass vase from their 'Old English Bullseye' range. Dates to 1950s or 60s. The vase has a polished / ground pontil to the base. It is unsigned but is a known Thomas Webb design. Webb Corbett ruby cased bud vase. Webb Corbett ruby cased bud vase.. Condition is Used. Dispatched with Royal Mail 2nd Class. Thomas WEBB Crystal. Cut Wine Glass. WEC22 pattern / design. 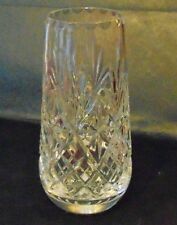 Beautiful crystal port / sherry glass by Webb Corbett. 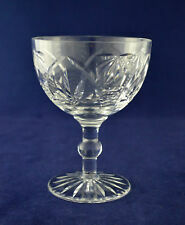 Made c 1947 - 52. vertical slice cut on bowl, faceted stem, star cut foot. Webb Corbett Bud Vase in Red. Webb Corbett. Cranberry Cut to Clear. Glass vase. Condition: VERY GOOD. And were made at Tutbury c1970. 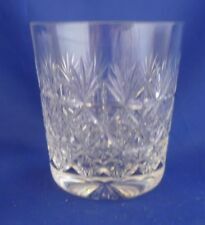 Six Webb Corbett Crystal Cut Glass Whisky Glasses Georgian Pattern c1970 Perfect Present. Crystal Cut Glass Whisky Glasses. These Whisky Glasses are all top quality hand crafted lead crystal. ROLLESTON cut / pattern. Stunning Webb Corbett Crystal Sherry / port glass / glasses. signed on the base, c1964. Gorgeous small cream jug that is in very good condition. Signed to base. None smokers. We have for sale a set of 9 cut glass crystal liqueur glasses, They are by Webb Corbett in their "ROLLESTON" pattern, made between 1947 TO 1966. These were made in their Tutbury factory as identified the the acid etched "T" in the centre of the WEBB CORBETT ENGLAND circle. Factory Mark / Label: Webb Corbett Crown mark on the bases,mark dates from 1970 onwards. As with all handmade glass,slight variations in size and weight may occur from glass to glass. Webb Corbett. Thomas Webb. Brierley Hill. STUNNING LEAD CRYSTAL CUT GLASS BOWL. Add to Favourites. We Accept Only. WEIGHT: 1 kg each. Royal Brierley. As new unused 6 crystal Thomas Webb whisky tumblers boxed in pristine condition. each Glass is 9cm high and 8cm dia. 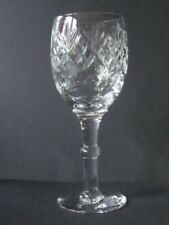 New listingWebb Corbett crystal wine glass, WEC22, 5.25" tall, signed. c 1947-52. WEC22 pattern / design. 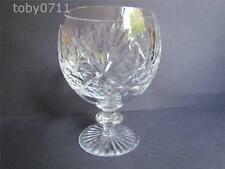 Beautiful crystal wine glass ( small! ). by Webb Corbett. Made c 1947 - 52, Stourbridge backstamp. vertical slice cut on bowl, faceted stem, star cut foot. Webb Corbett Crystal Ships Decanter Unable to identify pattern. Approx 24cm tall. Weighs over 2kg. The item is marked with one of the Webb Corbett marks on the base. Pre-owned, has some wear from the stopper and a small scratch in the neck, possibly also stopper related. Thank you for looking. Please view my other items listed for more Glass in this pattern. Dispatched with Royal Mail 2nd Class. These are 3 Lovely Cut Crystal Wine Glasses made by Thomas Webb. They are in Excellent condition and are stamped underneath with the Thomas Webb backstamp. WEBB CORBETT CRYSTAL "HILTON" CUT LIQUEUR GLASSES SET OF 8.